Scattered a couple of miles off the coast near Seahouses, this cluster of islands was declared by broadcaster Sir David Attenborough as his favourite place in the UK to see nature at its best. The Farne Islands have also featured in ITV’s Robson Green’s 2013 series “Tales of Northumberland”. During summertime around 150,000 breeding pairs of seabirds cram onto the islands. 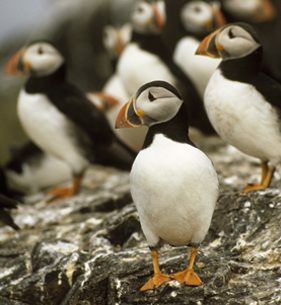 Around 23 different varieties of birds can be spotted here, including razorbills, guillemots, eider ducks and colourful puffinsare just some of the varieties that flock here. Look out for the island’s colony of grey or Atlantic seals hauled up on the rocks or bobbing inquisitively in the sea. The islands have the largest breeding colony in England with some 1,000 pups born here each autumn. Land on Inner Farne, Staple Island, and Longstone when the islands open in spring until autumn time. If seeing the seabird spectacle is your goal, plan your visit between mid April and late July to see the largest number of birds. Fluffy white seal pups can be seen on the islands from late October. Boarding the National Trust owned islands takes you right among the nesting birds – which can get closer than you might expect. Arctic terns protecting their nest sites swoop and dive-bomb unsuspecting visitors, so be sure to wear a hat to protect your head. Take a boat ride to the islands from Seahouses with Serenity Farne Island Boat Tours, where gaily-painted booking kiosks line the harbour. Boats run daily in the summer months and at weekends and school holidays throughout the year, weather permitting. The islands have strong links with Celtic Christianity and St Cuthbert, who lived on the islands as a hermit in the 7th century. The island’s other famous resident was young Victorian heroine Grace Darling who with her father William, the keeper of Longstone Lighthouse, set out in their small open coble boat to rescue survivors of the stricken paddle steamer SS Forfarshire which had struck Big Harcar rock in 1838. Grace, aged just 22 years old was hailed a national heroine. Follow in Grace’s footsteps and experience lighthouse living with a boat trip to Longstone Lighthouse.